As a star known for her love of bling, it was only natural that Black Eyed Peas star Stacy ‘Fergie’ Ferguson enlisted some serious jewels for her lavish wedding. Adding some sparkle to the lavish Malibu ceremony, Brazilian jewellers H. Stern provided a whopping $5 million worth of jewellery for the day, which saw the bride, groom and bridesmaids all decked out in the label’s glittering gems. Of course, the most spectacular pieces were reserved for the bride herself, with Fergie donning her one-of-a-kind specially commissioned Stars engagement ring, which features a four-carat cut diamond nestled amongst a star of smaller diamonds. Her diamond wedding band was designed to compliment the statement star ring, both created from H.Stern’s 18K noble gold, a trademark tone that’s almost antique in look. As for groom, Josh Duhamel, he wasn’t missing out on the action either, with Fergie creating a bespoke 18K white gold band for him to wear, too. Both wedding rings were engraved with personal messages. With her fingers suitably sparkling, the bride didn’t stop there, adding a Ropes diamond necklace to her hair as a veil, and Hera diamond earrings as hair pieces. 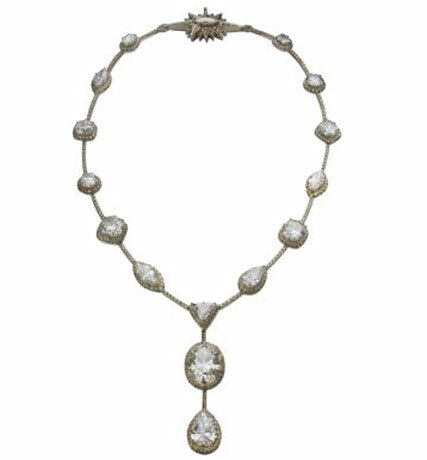 She also selected a Venus necklace (pictured) that featured over 80 carats of diamonds, Zephyr diamond studs, and the Lizard diamond cuff bracelet to complete her bejewelled look. After changing from the first of her custom-made Dolce & Gabbana wedding gowns, and into a second for the reception, Fergie also switched her gems, adding the Artemis earrings, and bracelets from the Stern Star collection. Not to leave out her bridesmaids, Fergie treated each of the ten-strong party to two Zephyr diamond hair clips, each worth $3,000 a piece. That’s some seriously generous bridesmaid gifts!